If you've been rocking an Xperia high-end smartphone for the last couple of years then you probably know that Sony runs an Android beta program where it tests the software on a limited number of devices before making it available for the general public. Since the Japanese company confirmed that the Xperia X Performance will be one of the first smartphones launched this year to receive the Android 7.0 Nougat update, it makes sense that the device joined Sony's Android beta program. The good news is Sony has just opened Android Nougat Beta registrations for the Xperia X Performance, but the bad news is it's only available for users in selected countries. First of all, if you sign-up for the program, you don't automatically get selected for the Android 7.0 Nougat program. 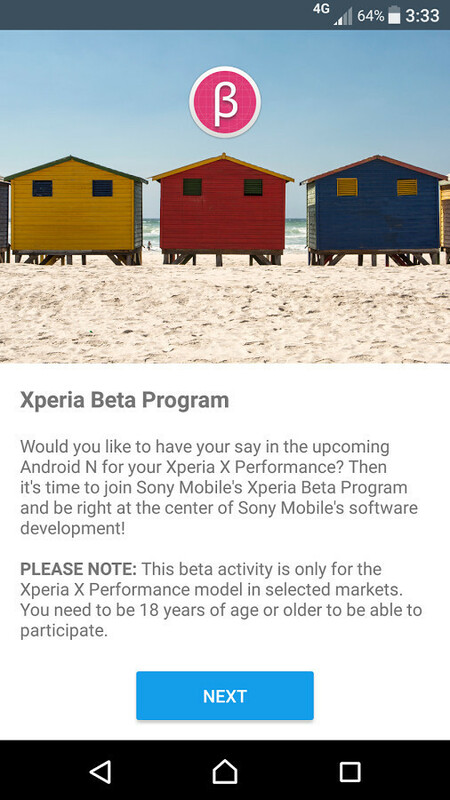 Also, the Xperia Beta Program is only available in Sweden, Norway, Finland, Denmark, Lithuania, Estonia, Latvia, Iceland, Italy, Spain, Portugal and Netherlands. According to Sony, the amount of users for this activity is limited, so the faster you sign-up, the better chance you have to be part of the beta program. Keep in mind that since this is a beta program, you'll be testing Android 7.0 Nougat builds before anyone else, so it's very possible that the software might not work as intended. If you're not comfortable with that, we don't recommend taking other peoples spots in this beta. It's also worth noting that while the beta program is not available the UK or the US, all participants are expected to communicate their experiences or any feedback they want to pass on in English. Quote: "It's also worth nothing that while the beta program is not available in the UK or the US, all participants are expected to communicate their experiences or any feedback they want to pass on in English." Why is that a requirement? Sony's staff in charge of it could simply translate their feedbacks from just about any language into English!